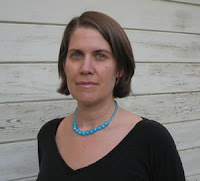 Elizabeth Treadwell's books include Wardolly (Chax, 2008) and Birds & Fancies (Shearsman, 2007). She is slowly working on some long poems and a picture book. All the poetry here is part of her manuscript “fleece pimsy,” formerly known as “Virginia or the mud-flap girl” and/or “Ancient Celebrity Tune-rot”; the first bit also appears in Try, edited by David Brazil and Sara Larsen, with thanks to them. under the shade of some annoying shade-tree, eh? darn! such o’er-directed art values! “Greg Fuchs: Talk about feminism. Where do you situate yourself in the history of feminist discourse? Elizabeth Treadwell is a radical feminist platform, little shorebird, little shore. I am not a theory-based artist. I speak as a U.S. citizen, born and resident in the area currently known as Oakland, California, U.S.A., an existence borne of my ancestors bodies & motions through the Irish, English, and Cherokee diasporas, and other disputed mysteries, sharecroppers, secretaries, and the occasional drunken tennis ace. Obviously life begins, begins again, or rather continues, at conception. Also at birth. These are lively events. Generally those called women exist as bodies usually capable of conceiving, gestating, birthing, and nursing children. It strikes me as self-evident that the final word on any decisions regarding such activities should rest within suchwomen. Once born, children here in the U.S.A. are routinely denied their full human rights and dignity, and instead taught painful lessons in tyranny, destruction, stupid and wrong-headed authority and conformity, fake intellectual standards, weird ways of (de)valuing their own and others existence, racism, sexism, classism, consumerism, institutionalized boredom and restriction. It is a sickening treachery. Take for example all our corporate storytelling and our profit-driven notions of beauty. What if the energy and resources currently spent on these consumerist abstractions were instead reserved for the localized articulation and idiosyncratic ornamentation of our stories and selves? Imagine how this might blend naturally as a girl grows up into a practical and compassionate society that provides all suchwomen full respect, care, and information throughout their years of reproductive potential. It’s hard to call a system that fails to fully attend to the most basic facts of our lives – birthing, nurturing the young, caring for the sick and the old, dying – a society. Obviously life begins, begins again, or rather continues, at conception, and again at birth, as mentioned. Any arguments around defining these occurrences merely serve as a distraction when it comes to the implementation of governmental/societal/medicinal/religious control of women. A full articulation of allwomen’s existence might help lead to states of health, justice, and beauty that in my experience of this time, place, and culture we can only begin to hope to tend. Such tending is one of the main purposes I humbly feel in my writing. I literally gasped when I read this: "Take for example all our corporate storytelling and our profit-driven notions of beauty. What if the energy and resources currently spent on these consumerist abstractions were instead reserved for the localized articulation and idiosyncratic ornamentation of our stories and selves?" We should have a forum where everyone contributes one "practical" idea re: how to do this. And then we'll have a guidebook. And we all have paper and printers and staplers already, right? To the bathroom stalls of America, then! ah, very nice idea, both of you. would like to see that. After reading the first 2 days of posts, I felt like I needed to add a P.S. to mine. I'm a bit haunted by some of the struggles described because they are both familiar & tedious, and I hate to think of so many young women going through them endlessly. It is incomprehensible, outside of certain creeping contexts, precisely how the presumption of maleness, along with several other presumptions & stereotypes, came to be embedded in the word "poet," so that the phrase "woman poet" becomes a fraught & common marker while the phrase "man poet" is rendered unnecessary; so that young male poets starting out have access to a glorified version of their gender-based forebears while young women poets starting out have access to only glimpses of a discredited version of theirs. Attempting to alter one's behavior/self in order to avoid/subvert "ghettoization" is a futile distraction, because "ghettoization" is at once arbitrary, systemic, erratic, and imposed from without. It reminds me of western medicine, where a historical preoccupation renders the "male body" "the norm" and so the "female body" becomes problematic and the pregnant female body even more so, although these are perfectly ordinary states. Race, class, and other queernesses come into it too. The question remains who is doing the othering, and to what ends.